Phases Lunares year 2020 to download in PDF and JPG format. 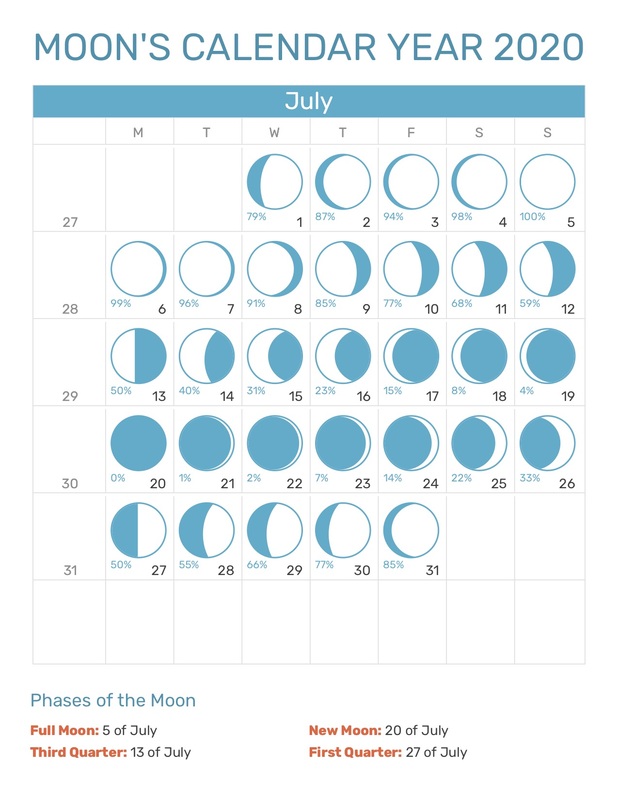 Check the current phase of the moon with this lunar calendar of the month of July year 2020. You can download the month you want in PDF or JPG format. Both versions are in high resolution, ready to print and are totally free. - Full Moon: is when the moon has a visibility of 0% since it is hidden behind the sunshine. - Crescent: is the phase of the moon when it begins to illuminate the horizon and comes to complete a circle split right in the middle. - First Quarter: Is when the moon reaches a state of divisibility of 50% like the crescent moon but this time to the opposite direction.